Peter Lamprey writes that he is continuing with operations over Germany. He complains that the station is a long way from the glamour of big cities although there are some closer hostelries. He concludes with banter and chatter about acquaintances. in any case they might just as well pull it down themselves as leave it to us to move. At least they will know where all the pieces are and it is a well-known fact that quite a number of air-crew are really careless with his stuff. The usual welcome was extended to us in the form of a really fine firework display, but I don’t think the bonfire was included in the programme. place to here boasts quite a number of places but the stuff they auction is long-range poison. However in another hamlet that is just a mite further away they sell the right stuff and naturally our little feet can be hear pattering happily in that direction. spot are definitely wrong, whatever side you are on. I am glad to see that Fred Baulch is still doing a bit of nightwork, he might not be fit for the army but I don’t think there is a lot wrong with his ideas. It strikes me that he has the right night-work idea and I the wrong. If I kept to that sort of target I shouldn’t go fair [sic] wrong. So our old pal Arch is coming back to take his position up again round the folder. Wish him all the best for me and hope he keeps fit. round stirring Boer War Veterans up. Hope J. Denny is doing OK in his effort for the new job. Remember me to anyone I missed on my last visit and look after yourself. Remember me to the OAP’s, Maint. [sic] [maintenance] Etc. 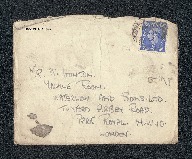 Peter Lamprey, “Letter from Peter Lamprey to W Gunton,” IBCC Digital Archive, accessed April 24, 2019, https://ibccdigitalarchive.lincoln.ac.uk/omeka/collections/document/6615.